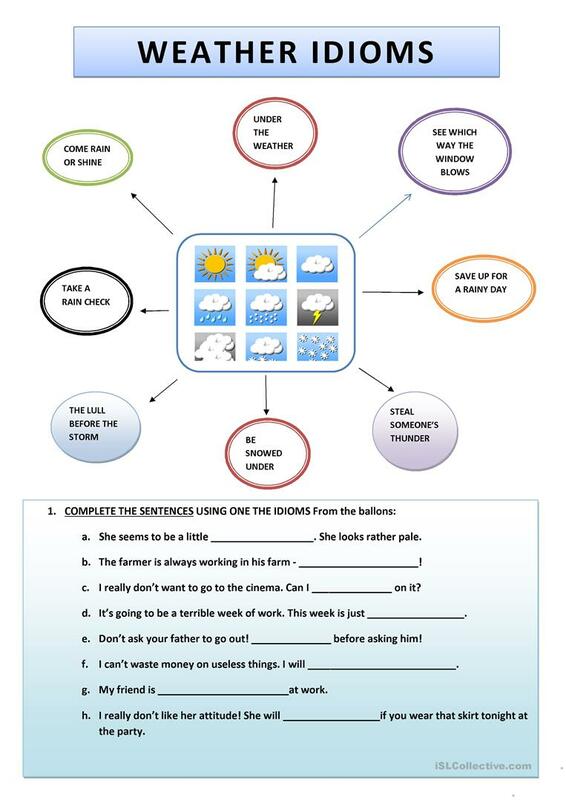 A worksheet about the topic: weather idioms. Gap filling. There are several expressions related to the topic. Then students are asked to complete the gaps. The worksheet can be used as an icebreaker and to practice idiomatic expressions. This downloadable printable is a great resource for business/professional students, high school students and adults at Pre-intermediate (A2), Intermediate (B1), Upper-intermediate (B2), Advanced (C1) and Proficient (C2) level. It is a valuable material for strengthening your groups' Spelling, Reading and Writing skills. It features the vocabulary topic of Idioms.